This vibrant CAC R-125RED red Rainbow 30 oz. pasta bowl is perfect for adding alluring accents to any restaurant, diner, or healthcare facility! 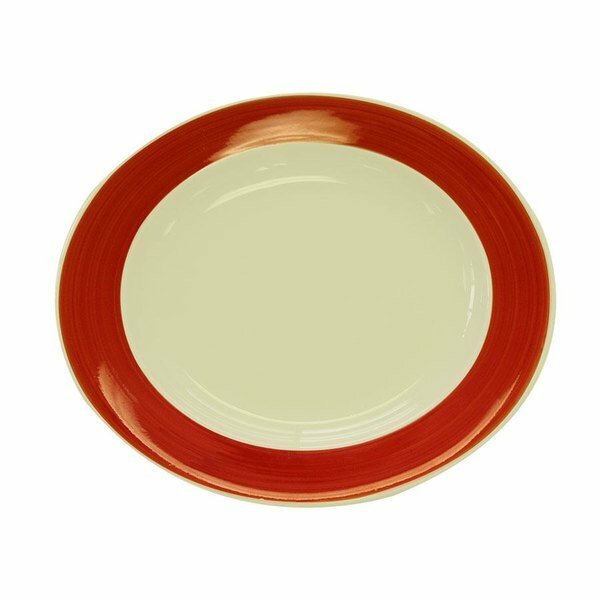 Constructed of attractive and durable stoneware, this plate will add a sophisticated feel to your meal service. Plus, with the red accent you can add a splash of color to coordinate with your restaurants theme or just to brighten things up. The rolled edge makes this plate smooth to the touch as well as easier to clean than a sharp, pressed edge. Whether you're serving up delicious orders of linguine, carbonara, rigatoni, or really any dinner entree, your guests will appreciate dining off of this beautiful plate.